Bangkok’s governor on Thursday appealed for help to battle the toxic smog shrouding the capital as the deployment of drones left Bangkok residents unimpressed. The city has been blanketed in a murky haze for weeks, inciting criticism from the public over the government’s response, which has veered from playing down the problem to abruptly shutting schools. Authorities have seeded clouds to provoke rain, sprayed overpasses with water to catch micro-pollutants, and even urged people not to burn incense ahead of Chinese New Year. Troops have also been asked to inspect factories across the country. On Thursday drones dispersed water to help clear the air of the harmful microscopic particles known as PM2.5 — a tactic that drew scepticism and derision from Thai social media users. Bangkok governor Aswin Kwanmuang compounded the sense of frustration by calling on “all sectors” to find a solution. “I don’t know everything, so I’m inviting everyone to help,” he said Thursday, in response to questions from reporters about the effectiveness of the drones. His plea comes a day after he declared Bangkok a “control area”, closing hundreds of schools until Friday and announcing a ban on cars that use diesel and burning of any kind within the city. Violators run the risk of three-month jail sentences and fines. The lingering pall is due to exhaust fumes from traffic, the burning of dead crops, and pollution from factories getting trapped in the city. Junta leader Prayut Chan-O-Cha on Wednesday stepped up the rhetoric, appealing to Bangkok residents to carpool and for the army to “check” factories in all 76 provinces. “I will ask the army to go and check every factory…and directly report to me,” the premier said. 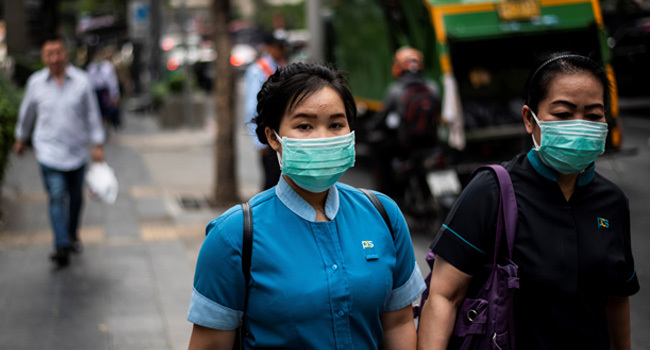 Bangkok’s dangerous air pollution makes it vital for the government to take “decisive action”, said UN Environment’s regional coordinator for chemicals, waste and air quality Kakuko Nagatani-Yoshida. Authorities remain tense over growing gripes about the haze and the government’s risible response, which has started to cloud political debate and worry officials about its impact on tourism during the high season. Thai police on Thursday announced the arrest of a man for allegedly posting “fake news” online after he said a woman had died from the airborne particles. Charged under the Computer Crime Act, 36-year-old Wattana Pitanwattanathitikul will face up to five years in jail if convicted. “This message not only caused panic among members of the public, but it could also cause economic losses in terms of tourism,” said police spokesman Colonel Siriwat Deephor.